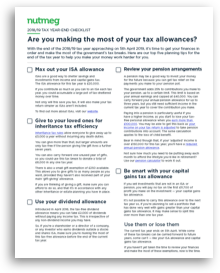 A handy checklist to help you sort your finances for the 2019/20 tax year. Enter your email below to download your copy today. As with all investing, your capital is at risk. Pension and ISA rules apply. Tax treatment depends on your individual circumstances and may be subject to change in the future.